For Iran, like Russia and some other countries, a letter of invitation is needed from a tour company before a tourist visa can be applied for. Before then you complete an application form and send this to the tour company. For British citizens (and US, Canadian and Australian ones too) you have to travel within Iran with a guide. So for my trip the application forms for all of our group had to be submitted before the tour company could then apply to the Interior Ministry in Tehran for authorisation. The authorisation comes in the form of a code. That code then entitles you to go to the Iranian embassy or consulate that you have specified on your application form in order to have the visa put into your passport. In the case of a UK resident, at the moment this means either travelling abroad or engaging the services of an agency to take your passport to the relevant place. Each embassy/consulate seems to have slightly different requirements as to whether or not you must attend in person and/or have fingerprints taken. For Dublin the requirement was to attend in person but no fingerprints were required. I had made the initial application via the UK tour company in early May against the promise that the group applications would be forwarded to the Iranian agents by 15th May. In fact, the UK tour company did not forward the applications for another two weeks after then. This was because they decided to admit some late applicants to the trip. The authorisation codes were not issued until 6th July – so 6 weeks of anxious wait against the background of the political negotiations on Iran’s nuclear capabilities. The fear was, of course, that if those negotiations failed then obtaining a visa might become more difficult or impossible. Fortunately the negotiations achieved an agreement. But the late issue of the codes meant that there was just 3 weeks to organise a trip to Dublin amongst work commitments. The Iranian consulate does offer a same day service so I thought I would try to take advantage of that. Originally I had planned to have a more extended stay so that I could explore a few of Ireland’s 3,000ft peaks. That will have to wait. So as mentioned in a previous blog I booked with Ryanair from Leeds-Bradford Airport a (relatively cheap) return flight on 15th July. My flight out was at 6.30am (so an unpleasantly early start) but it did enable me to reach the consulate before its opening time at 9.30am. I had hired a car for the day to get me between Dublin airport and the consulate. Even at 9.20am when I arrived at the consulate there was quite a queue. I feared a long wait. Fortunately I was seen by 10.10am by the friendly Iranian official and handed in yet another (different) application form, some photos, a wodge of cash and my passport. I was told to come back at noon. So I went away and found a café in a local mall to kill an hour and a half. I managed to string out a hot chocolate and bun for that period before returning to the consulate. The passport was ready with the substantial visa (shown in my earlier blog) stuck into it. I then texted Ciaran, whom I had tentatively arranged to meet for lunch, to make arrangements to meet. We settled for a rendezvous at the airport after I had dropped off the car as his office is quite close to the airport. We had a good natter and he was, I think, a little surprised about my reasons for being in Dublin! After the stress of waiting for the visa authorisation to come through I was able to concentrate on preparing for the trip. Now that the UK and Iran have re-opened their respective embassies, perhaps the visa process will become easier in the near future. I had got back into my training regime and though I was not as fit as before my South America trip I thought I would be OK for Iran. So come 31st July the day of departure had arrived. My trip to South America had required two 110l kitbags stuffed with about 35kg of gear. This trip had one 110l kitbag with just 18kg of gear. This included some stuff that I would probably not require – i.e. ice axe and crampons (which would only be needed if there was significant recent snowfall). I also stuffed my 38l Osprey rucksack with boots and other essential kit and would use that as hand luggage on the flights. The flight to Tehran would be with Turkish Airlines via Istanbul from Manchester Airport. The departure was an evening one so I did not need to leave home until late afternoon. I had been told that another from our group would also be flying from Manchester. But I did not in fact meet him (Neil) until I reached Tehran although he was on both flights that I took! The 3½ hour flight to Istanbul was uneventful but I was to have a five hour stopover there. Other members of the party would be coming in to Istanbul from other airports. Two more we would meet in Tehran. There were seven in the party. Ataturk airport is huge. And busy. And efficient. We arrived just as the sun was rising. The departure boards showed all sorts of exotic destinations in the Middle East including Baghdad and Basra. I wandered around a bit to look around. But, as I had not had much sleep on the flight and was feeling a bit zombified, I found a couple of seats to settle down on. I must have snoozed for half an hour. But my subconscious would not allow me to drift away into too deep a sleep. I did not want to miss my onward flight. Eventually a departure gate for the onward flight appeared on the departure boards. Of course, it was at the other end of the airport! So I had a 10 minute hike to it. By then it was packed. As my eyes scanned the waiting passengers, I was spotted by three of my group – Arrvind from London, Phil from Essex and Yde from Utrecht. The walking boots had given me away. That together with my rucksack! The sun was just rising as we boarded the onward flight. Our route east took us first north to the Black Sea and then we followed the north coast of Turkey. The airline had put our group in different locations on the plane so there was no opportunity to get to know each other. I tried to sleep some more but without success. We swung slightly south and passed to the north of Van and to the south of Mount Ararat (though I did not see this being on the wrong side of the plane) and on over Iran. The ground beneath was, at first, quite verdant, the otherwise arid land fed by snowmelt and precipitation coming off the mountains to the north, but soon turned into proper desert. Tehran sits right at the foot of the Alborz range of mountains. The city’s elevation rises from around 1,250m above sea level at its south to 1,950m at its northern end. Tehran only became the capital in 1796. Previous capitals of the Persian Empire had been cities in the south of the country. It has a population of around 8.5 million (with a couple of million commuting into the city each day). The city’s principal airport is now Imam Khomeini International Airport which lies around 30 miles to the south of the city centre. This airport was large and modern, but strangely deserted. A couple of Iran Air planes looked lost on the aprons in front of the huge terminal. It had taken 3 hours to fly there and it was here that the fun started. It took almost 1½ hours to clear immigration. I had been in one particular queue for 70 minutes when the official at the desk decided to leave, leaving me and five others high and dry. Fortunately the people in the queue to my left took pity on me and allowed me to push into theirs. 10 minutes later I was through. Neil (the one who had been on both of my flights) had managed to get through immigration in about 20 minutes. That is bureaucracy for you. Notwithstanding the hoops one has to go through to obtain the visa, it was not possible to waive people through once the presence of the visa in the passport had been ascertained. No! The passport had to be scanned, a computer screen frowned at, some tapping on the keyboard undertaken and a call or two on the phone taken. It had taken so long to fight our way through immigration that our transport had gone. So our fixer (Ahmad) who was waiting for us had to organise two more taxis to take our group into Tehran. The city is enormous. What was immediately evident was that, notwithstanding the sanctions to which it has been subject, the country (at least around Tehran) has pretty good infrastructure. The first part of the journey was speedy along a modern 6 lane dual carriageway. At one point we passed a huge mosque complex constructed in memory of Ayatollah Khomeini. It looked largely complete but a couple of cranes stood high indicating that some work was still continuing. Soon after then, the roads became busier and busier. They were jammed with Toyotas and Peugeots (sanctions?). There were motor bikes and scooters galore, often driving against the flow of the traffic. If there were any rules of the road, I am not sure what they were. Pedestrians put their lives into the hands of others as they dodged between fast moving vehicles as they crossed the roads. Pedestrian crossings were meaningless features. An hour or so later at about 6pm we arrived at the Ferdowsi International Grand Hotel. It was baking hot – somewhere near 40oC. The reception area certainly lived up to the name of the hotel – grand and elaborate. Rooms were allocated – I was to share with Yde – and it was agreed that we would meet at 7pm in the lobby for a briefing and further introductions. This gave us just about enough time to sort our gear for the first part of the expedition. We only needed a limited amount for this part. The remainder of the gear could be left in Tehran and be picked up for the second part. When Yde and I returned to the lobby at 7pm we found a promotional video being shot with actor, cameraman and bright lights. The actor was seemingly demonstrating the virtues of a credit card with multiple takes of the card being swiped through a card reader. The action followed us into the bar area where the others were. Here we caught up with the other two in the party, Stuart and Rob. They had come in on earlier flights. Although we were now in a bar, there was no question of alcohol being available. So we had soft drinks, tea and cakes. We were introduced to our guides. The principal one, Mehti, would lead on the first mountain and then come with us to Damavand. We were to be ready for 9am the following day. We talked about our respective experience. I suddenly felt relatively inexperienced. Neil – from Sheffield. Married, aged 63 and runs his own business and has a house in the Alps. Has climbed Kilimanjaro, Mont Blanc and been to Everest base camp. Arrvind – from London, a psychiatric nurse now divorced. Aged 52 and originally from Mauritius but has spent most of his life in the UK. Has climbed Kilimanjaro, Elbrus and done lots of trekking around the world. Yde – Dutch, aged 31, single and works in insurance/pensions. Has done Muztag Ata (a 7,400m peak in China), Kilimanjaro, Elbrus, Aconcagua, Spantik (another 7,000m peak), Mont Blanc and other mountains in Europe and South America. Planning to do Cho Oyu (one of the world’s 8,000m peaks). Rob – also aged 31, single and from Essex. In IT. Seems to live for adventure in the mountains, including spending 8 months bumming around Ecuador and Peru climbing or attempting some high Andean peaks. Also done Mont Blanc, Kilimanjaro, Kazbek, stuff in Iceland. Now aiming to do the Volcanic 7 summits (i.e. the highest volcano on each of the 7 continents). Phil – also from Essex, early 40’s and single. Again seems to work in order to do mountaineering. Did Aconcagua a few years back and Ojos del Salado about 3 weeks after I did. He has also done Kilimanjaro and peaks in Nepal. Stu – aged 40, single and an aeronautical engineer. Originally from Wigan but has lived mostly abroad in recent times. Was just coming to the end of a job based in Switzerland. He was by far the most experienced among us having climbed Cho Oyu, Aconcagua, Kilimanjaro, Elbrus, Kazbek, Carstenz Pyramid (highest mountain in Australasia), Vinson (highest mountain in Antarctica), Mont Blanc, Pik Lenin etc etc. This was his 23rd expedition. It was then time to eat something. Arrvind excused himself but the rest of us resorted to the hotel restaurant. Kebabs of various kinds were ordered. These were OK but a little disappointing. There was a salad bar that we could raid and which we risked (i.e. the risk of dicky tummies, though only Neil suffered later). We were given water and a fizzy drink of our choice. The bill was amusing in that the cost was over 3.6 million. Fortunately there are 46,000 rials to the pound, so the damage was not as great as it might otherwise sound. So that was the end of day one and I was glad to be able to get to bed. So my initial impression of Tehran was overwhelmingly dominated by cars, cars and cars. Oh and the smog. 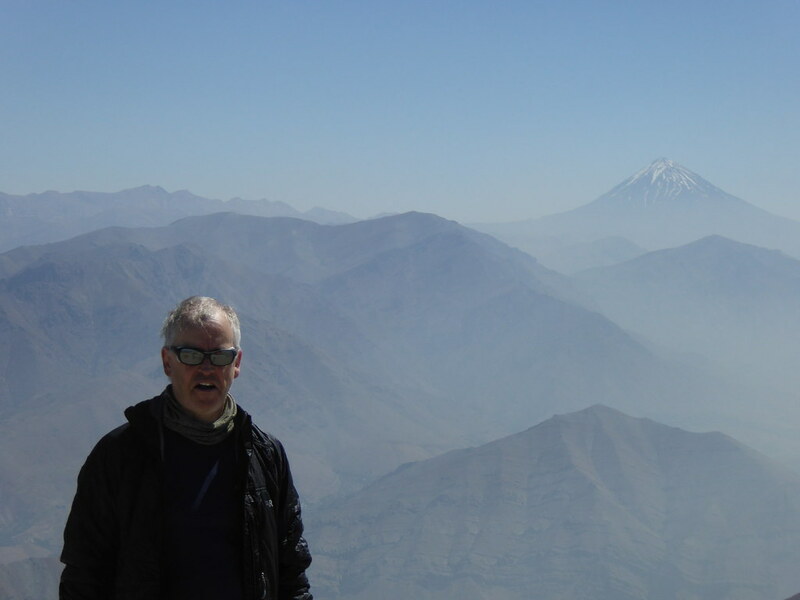 We could not see the mountains that rise to around 4,000m that look over Tehran. But I was looking forward to the next stage of the adventure. It’s funny how, having done a blog on peakbagging, a number of related commentaries appear. Now we have this. I think I need to be shocked and upset at the “accolade”. Does this make me “dull” too? Myrddyn Phillips takes it all in remarkably good stead. But I think that it is all remarkably unfair on Rob Woodall. The fact that he has visited nearly all 6,100 triangulation pillars in the UK deserves an award other than “dull” – “obsessive” perhaps. It also underplays the fact that Rob Woodall is probably the country’s most renowned hill walker having done all the Munros, Corbetts, Grahams, Donalds, Marilyns etc etc in the UK and many mountains all around the world.